Sock monkey sheets make going to bed more fun than ever. From crib bedding up to queen size all with a monkey flair. Crib size sheets are perfect of any monkey themed nursery. Add a monkey duvet and a sock monkey toy and it will create a cozy inviting space. If you are wanting some monkey nursery bedding, there are some lovely soft blankets and throws available with a monkey theme. Bobby Jack bedding range have some fun monkey accessories for the bedroom. 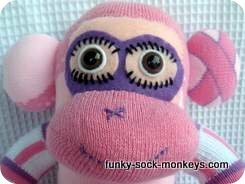 Sophie sock monkey wears a pretty pink dress and features on throw blankets, pillows, curtains and duvets. 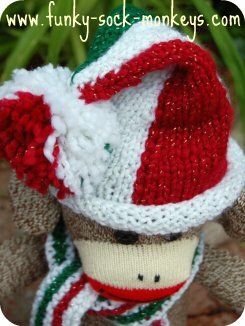 Sock monkey fabric is available in many colors and styles. Flannel or cotton fabric can be made into cute sock monkey baby sheeting. So, if you are handy with a sewing machine and make some stylish custom made sheets, you can add to the bedroom decor items such as cushions, you can wrap picture frames with the fabric, create toy bags and anything else you can possible think of. Sock monkey accessories can be placed throughout a room to tie in the monkey theme such as clocks, keepsake boxes and more. I don't think you can overdo a monkey themed room, the more the merrier. 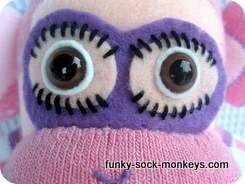 The most important accessory is an original sock monkey. If you are going to have sock monkey bedding in a room it is a must to have a sock monkey. 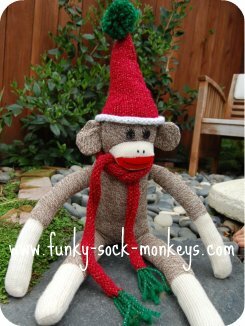 If you haven't already got a sock monkey you might want to order yourself a pattern book and some socks and make a traditional hand made sock toy to pop on the bed or somewhere else in the room. For ideas and hopefully some inspiration our monkey gallery has photos and information on how each monkey was crafted and altered. I try to make each one unique and by highlighting certain aspects of the socks I'm using. A fun example is the blue and white high top socks that made a really trendy looking sock buddy. His eyes are just above peering out at us. On his page are detailed instructions on how he was made and photos to show you some of the finer details that were applied. It's those fine details that add loads of interest and make him special.